Last fall, the Transportation Safety Board of Canada (TSB) released Watchlist 2018, which identifies the key safety issues that need to be addressed to make our air, marine, and rail transportation systems even safer. Every year, there are millions of successful takeoffs and landings on Canadian runways. However, an accident can occur when an aircraft or vehicle mistakenly occupies an active runway. From 2013 to 2017, NAV CANADA recorded an average of 445 runway incursions each year. Although the vast majority of incursions posed little to no risk, some of them have the potential to be catastrophic. Since this issue first landed on the Watchlist in 2010, TSB has completed at least 10 investigations into runway incursions. 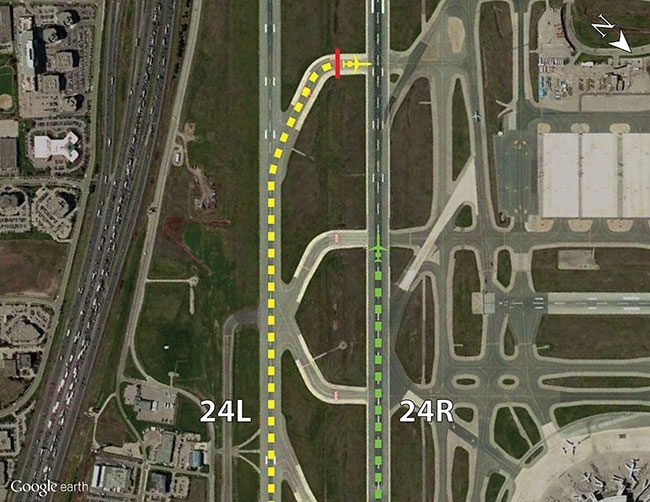 In January 2019, we released a safety issues investigation (SII) focused entirely on two parallel runways locally known as the South Complex at Lester B. Pearson International Airport (CYYZ). That report, which examined a group of incursions between 2012 and 2017, found 27 instances where an aircraft had landed on one runway – the “outer” one – only to incur on the other “inner” parallel runway while taxiing back to the terminal. Pearson International is the largest and busiest airport in Canada, and its airport traffic is tightly controlled and monitored. For instance, flight crews receive specific instructions from air traffic controllers to “hold short” of active runways. Crews also receive cues from multiple lights, warnings signs, and painted lines on the ground. So why do incursions still happen? The answer goes to the heart of airport operations, human psychology, and even airport geometry. To start with, the rapid exit taxiways, or RETs, that are used by aircraft at CYYZ’s South Complex are different from almost every other major airport in North America. For example, the exits lead directly to the “inner” parallel runway, the hold-short lines are located immediately following a 65-degree curve and, most notably, are farther away from the protected runway. These uncommon features mean the hold-short lines are not where crews are expecting to see them. If crews who are unfamiliar with the exits are also operating a regional jet – the most common type of aircraft involved, and one with relatively fast taxi speeds – they will have even less time to recognize the lines in time to stop before incurring on the runway. Speed and the unusual placement of the cues are not the only contributing factors. Distraction – often created by the flight crews’ own Standard Operating Procedures – also compounds the risks. For instance, it is normal for many crews to initiate their post-landing actions immediately after exiting the runway. Doing this, however, can take their attention away from other more critical tasks, such as watching for the hold-short line. But telling flight crews to keep “heads-up” doesn’t always solve the problem. When one procedure says to be heads-up upon leaving the runway while another says “complete your post-landing actions,” flight crews often opt for the action – becoming distracted at the worst possible time. TSB, therefore, made four recommendations to reduce the risks involved. Some of those recommendations target problems specific to CYYZ. Others are more general and could help reduce risks across Canada and around the world. The first is aimed at air-traffic controllers, who are the last-line of defense in these situations. When controllers issue critical instructions, flight crews may not always respond appropriately. Either they don’t realize an order is being directed at them, or they don’t recognize the significance of what was said. That’s why the Board recommended that NAV CANADA modify controllers’ phraseology to better capture crews’ attention – for instance, using the word “immediately,” or even repeating the instruction. The next two recommendations – one to Transport Canada, the other to the U.S. Federal Aviation Administration – would see flight crews’ Standard Operating Procedures amended so that post-landing actions are only begun after an aircraft has cleared all active runways. This would keep flight crews’ attention focused outside the cockpit when approaching and crossing active runways, and reduce work-related distraction at critical moments. 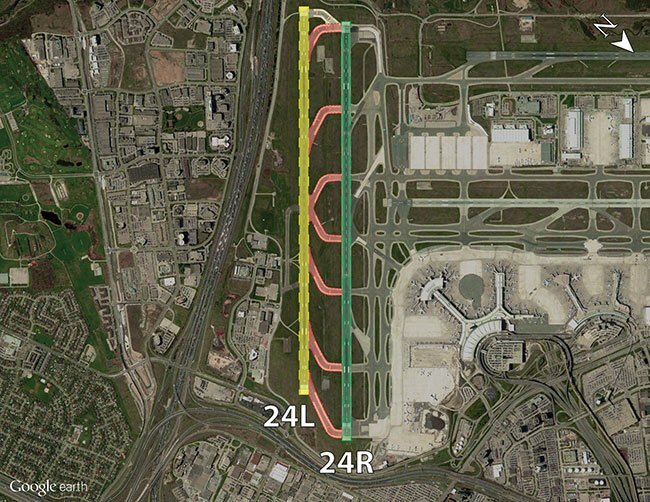 Finally, the Board has recommended that the Greater Toronto Airports Authority (GTAA) make changes to the taxiway layout at Pearson International’s South Complex. They could, for instance, change the design and position of the rapid exits, create a perimeter taxiway to go around the other active runway, or even construct a separate intermediate taxiway between the two parallel runways. The final choice will be up to the GTAA, but in the meantime, further improvements are required to increase the visibility of hold-short positions. Because clearly, more needs to be done so that all flight crews see the cues and react as required. Beyond the four recommendations to emerge from TSB’s Pearson SII, there are other broader solutions that also address the risk of incursions. These include a greater use of technology – such as in-cockpit electronic situational awareness aids – and direct-to-pilot warnings, such as runway status lights. Another option is improved surveillance and warning systems. This issue will remain on the TSB Watchlist until the rate of runway incursions, particularly the most severe, demonstrates a sustained reduction. In the meantime, TSB will continue to monitor and push for safer skies – and safer airports – for everyone. Kathy Fox is Chair of the Transportation Safety Board of Canada, an independent agency that investigates aviation, marine, pipeline and railway transportation occurrences.